My husband and I bought a two-unit building in 1998 so we could live in one of the units, the lower unit, which looked out onto a garden I loved. We moved in and renovated that unit, condo-converted the building and when the tenants upstairs moved out, we renovated the upper flat and moved into that and rented the unit below. This was over a period of 8 years; it didn’t happen overnight and everything was not easy. The rent now pays our mortgage and real property taxes, and we have two legally separate condos. That’s why buying a two-unit building can be a beautiful thing! If you’re thinking about a two-unit building, give me a call! I’m an attorney, have managed my own remodels, and know the ropes in San Francisco and can help you develop a strategy. 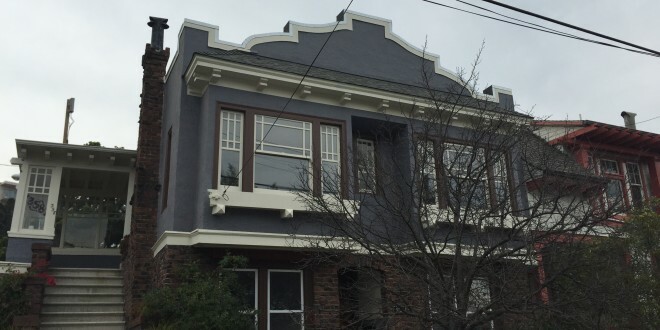 By the way, the photo is of an architecturally significant two-unit building with a charming cottage in the back that I am bringing on the market in Eureka Valley soon. Previous: Comfortable Lodging Around the World For Free! Next: They Got Into the SF Market!